I am Tabra Tunoa, Fabulous, Creative, Jewelry Designer, Artist, and Very Courageous World Traveling Adventurer. That’s how I like to think of myself…. In the summer of 2006, I decided the time had come for me to stop designing and manufacturing jewelry in the U.S. and move “Tabra International” to Bali, Indonesia. I couldn’t afford health insurance for my employees any longer and the increasingly difficult economic times were stressful. I had marched and marched in the streets of San Francisco protesting the beginning of the Iraqi war and was becoming discouraged as the war started anyway and then dragged on year after year. I was angry, depressed and obsessed about it. I was losing interest in creating beautiful art. My business had grown from selling jewelry on the street to a corporation with jewelry sales close to five million a year. My business won the “Inc. 500” Award for one of the fastest growing small businesses in America for two years in a row along with a prestigious Award for Diversity and Social Responsibility in the Work Place. There were many newspaper and book articles written about the way I created jobs for refugees. In 1997, I faced a difficult life situation. I went bankrupt and lost everything – my house, my car and of course, my business. I was penniless with no prospect of a job. Realizing that there was no one who would hire me at the salary I wanted or give me the freedom of “running the whole show,” I began slowly and painfully to rebuild my business. During my 20s, I lived with my son in various countries in the South Pacific, the Caribbean, Europe and Central America. I only returned to live in my home in Texas, when it became clear that the war in Vietnam was ending. However, I never really fit in there, so my former college art teacher suggested that I should try Berkeley, California. Sure enough, at the age of 29, I found a place where an eccentric, non-conforming gypsy, hippie artist and single mother, could thrive. I sold on the streets of Berkeley for many years before deciding to try the Renaissance and Harvest Festivals. That’s when I began to make real money from designing and creating my hand-made jewelry. The next step was to hire employees to meet the growing demand for my work. I also hired a professional business therapist to teach me how to manage and run a business. For some 30 years, while traveling in remote corners of the world, buying stones and beads, looking for inspiration, and selling in fairs across America, I continued to grow my business and raise my son in California – all at the same time. In 2006, with my son grown up, and me without a significant other, I was ready for life in another culture again. I was ready for more adventure. I would go alone and I would be okay. After making that difficult decision (the logistics of it all were absolutely daunting), I gave my employees six months to find another job. The majority were Asian refugees who had fled oppression in their own countries. Some of the refugees had worked with me for 20 years and many had chosen my company when they first arrived in the U.S. fresh off the boat, so to speak. They took my announcement with amazing grace and supported what they knew I had to do. Powerful Bronze Indonesian Moon Goddess Amulet Bracelet With Lapis Lazuli Eye Symbols To ard off Evil and Protect the Wearer. Set in Sterling Silver Designed by Tabra and Fabricated in Bali. Some of my employees found other jobs right away and some stayed with me until the end – helping me with the difficult business of closing down my life in America. Some didn’t like the new jobs they found, returning to work with me again until they could find another job that suited them better. I had been advised that this was not the way to close the business – that it would be best to announce the closing as I passed out their final checks, the same day I closed, but I closed my business in the manner I felt my employees deserved. They had to make their own adjustments and it would be difficult for them, as well. What I kept reminding myself throughout the process was “this is not all about me.” We had worked together for so long, through major ups and downs, and they were like family. Those who stayed with me got jewelry-making equipment, office supplies, computers, beads and bonuses at the end. Everyone got something. During those hectic six months, I took time to write up plans for my future – a one year plan, a five year plan and a twenty-five year end of life plan. It was important for me to be very clear with myself about what I wanted to do with the remainder of my life. I decided that Costa Rica and Bali, Indonesia would be my focus countries. I knew that I wouldn’t be happy being tied down to just one country or one culture and I wasn’t finished designing and creating. There were still many women who enjoyed wearing and collecting my jewelry and I wanted to supply them. I also knew that wherever I went, helping educate young women in Third World countries would be an important part of my life. That would be my gift to the world. Figuring out what I would need in my new life and what I should let go of, working with lawyers, accountants, realtors and distributors, shipping beads and stones to Bali – took the full six months. It was difficult, fun, physically and emotionally exhausting, exciting and sometimes sad. I was working 16 hours a day, making important decisions every hour that would directly affect the rest of my life. Although it was scary, there was really no time to think about how difficult and complicated I was deliberately making my life. On the third of January, 2007, I flew to Bali alone – to begin the next phase of changing my world: setting up my workshop and making my jewelry in Bali, selling it directly on my new website www.tabra.com and opening up my beautiful little gallery on Hanuman Street in downtown Ubud, the Art and Cultural Center of Indonesia. I continued to sell my Tribal, Modern/Ethnic Jewelry to wonderful craft galleries in the U.S., Australia and Japan. I hired five smart, young Balinese women and began English classes for them and Indonesian classes for myself – so that we could communicate. I told them my life goals and they told me theirs. That way we could all help each other achieve those goals. Three months after arriving in Bali, my condo back in California, sold. I took the profit and made a down payment on 85 acres of jungle and a small cabin in the Turrubares Mountains of Costa Rica. I put the rest of my money into gold and silver investments. I had worked with silver and gold for so long, I felt I understood that market best. It turned out I had made wise decisions. I sold my house and invested in metals at a very good time. My future plans continue to develop as new opportunities arise or the unexpected occurs and I have to change directions. However, my overall plan has remained the same: live part of the year in Bali, visit my friends and family in the U.S. every year and develop my land in Costa Rica for eventual retirement. I will build cabins for my artist friends, people I like and family to live near or visit me often as I grow older. It will be another calculated, but crazy adventure. The challenge of changing your world takes the courage to be different, to risk disapproval, and to take chances, but for me, it has been worth it. My life is interesting and full of change. I have no regrets. I love the world I have created for myself. Returning to the U.S. to see family and good friends for a few weeks each year is very important to me. I miss the long walks in the forest with my best friend and seeing her two or three times a week in California. Best friends are not replaceable. But I write long letters and visit her twice a year and I cherish the memories I have of the good times. I have made many mistakes, but I have tried to learn from them and live my life with grace. Now, I am ready for new challenges. My life in America is finished. From time to time, when things get really tough, I tell myself that maybe I will settle down and live a safe, uncomplicated, predictable life. But I can’t. And, anyway, I don’t want to. I’m addicted to adventure and change. 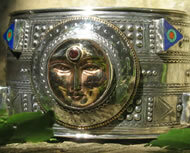 Internationally known artist, Tabra Tunoa, is a leader in the Contemporary Ethnic style of Gypsy Jewelry. She studied Mayan and Aztec art at the University of Mexico City and in San Jose, Costa Rica. She also studied jewelry design at the Masana Art Institute in Barcelona, Spain in the 60″s and 70’s. 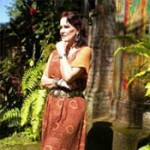 She continues her work today designing jewelry and working with young Balinese women in her home near Ubud.